A few days ago Richard at Free The Animal posted New Free the Animal, Resistant Starch-Based Dietary Guidelines. I want to comment, because I really like the direction Richard has taken Paleo. I probably have more in common with him than any other nutritional blogger. Although we both started in the Art De Vany low-carb camp, we’ve both embraced a non-restrictive approach to Paleo. In other words, in our world carbs are fine. With so many neurotic Paleo bloggers peddling products around hyper-restrictive eating ways, I think Richard’s latest post is a great place to start. Before I add my tweaks, I want to say that I am now ready to start experimenting with the resistant starch. It is something I’ve been half paying attention to from afar. The aspect that interests me the most are the reports of increased body temperature. A new experiment will begin soon. Dairy wasn’t mentioned on the list. For me it is a staple. I love kefir, butter, ice cream and cheese. I like how the Ray Peat fans use the saturated fats of dairy as a way to increase protein without increasing PUFA. I also snack on cheese now instead of nuts. If you can’t do dairy, I’m sorry. Thankfully I can. I just finished a 3 post series on the metabolism damaging effects of PUFA and how the body has a limited ability to process those fats and how they can take years to leave the body. Personally, I’ve decided to forgo nuts to provide my body with a mathematical edge to speed up that process. Plus, I can’t eat just a handful. I find them too palatable. I agree to avoid canned beans and importance of soaking. However, when I do have beans I go the extra step and sprout the beans. I don’t know if this makes the beans more digestible. It works for me and it is a trick I learned from my WAPF peeps. I don’t take all the ones on Richard’s list. Keep forgetting about zinc. Me and a few friends are currently experimenting with copper and L-Tyrosine to see what effect they have on reversing gray hair. I also take Icelandic sea kelp tablets. My 2013 Supplement post. Probably the only disagreement I have is with the advice to “Lift heavy things in compound fashion once every week or two”. I do think performing resistance training is extremely important. It is the “heavy” and “compound” parts that I have issues with. Very few people will say this, but I feel that focusing on the actual weight is a mistake. I explain this more in the post Reps, Sets and the Weight Aren’t that Important. The important thing about resistance training is muscle fiber activation. You can do that with a heavier weight, but you can do it more effectively and safer by slowing down the movement. By taking momentum out of the movement, it gets both harder and safer. There are some good compound exercises and some poor ones. I like exercises that have minimal skill requirements, are safe to perform at a variety of speeds and where I can safely to go to failure. Those are the exercises that are least likely to result in injury. This is why a goblet squat is superior to a barbell back squat. A push-up is superior to a bench press. And a combination of rows and chin-ups are superior to deadlifting. Yes, I am aware that is blasphemy, but that is how I see it. Funny how Paleo is turning back toward Weston Price. Thanks for sharing your adjustments to Free the Animals post. I read his blog also, thanks to you, he comes across like a curmudgeon, the grumpy old man, but his ideas on nutrition and excercise are helpful. Nuts are limited to Walnuts and Macademia Nuts (I add an 85% dark chocolate bar which I break up into a trail mix) I limit that to a quick snack when possible. Excercise: For me, the powerlifts, of the 5/3/1 variety work wonderful. Keeps me strong and lean. I agree with your point of safer lifting, however, due to personalizition of a ‘program’, this should be considered for people. As an example, goblet squats are great, but properly preformed back squats can be safely preformed with a MUCH greater weight. My belief is the higher weights stimulate Testosterone and get T-glut activation working (aka Kiefer of CBL fame) better than lighter weights. ===The climate affects what chickens will eat when they are relatively free. Cheese and coconut oil are o.k. with eggs. In Mexico I might eat several eggs in a day, in the US usually one large one. ===I don’t think it’s good to use marrow bones very often, the high iron content, especially if it’s boiled much, is likely to cause problems, and I think 24 hours of boiling would turn marrow into something awful. ====It will probably say on the container, and varies with the brand; I don’t know of any brand in the US that I recommend for frequent use. ===No, usually far from it. ===Yes, cherries and watermelons are among the best fruits commonly available in the US. Cafe con leche, cherimoyas, white sapotes, pawpaws, oyster stew, and parmesan cheese. Two or more quarts of milk, oysters, and cheese, yes, plenty. In the stuff below, the only inaccuracy is about the imported food issue, some imported fruits are very good, and many frozen things have been chemically processed, so it’s important to be familiar with each fruit. Ray Peat’s diet, was Re: Do Calories Really Count? recommends. This is from 2005. – dairy, fruit and meat are the core of his diet. or lamb, in one or two of his meals. sugar with it: about 1:1 fruit to meat, and about 2:1 fruit to cheese. properties, but it can be handled if consumed with fruit and gelatin. the meat is aged he doesn’t like the taste so he doesn’t eat much of it. degrade the nutrients he says). – he avoids all fatty fish. who got hepatitis from raw seafood. – he avoids most vegetables due to their intrinsic (defensive) toxins. stimulate the thyroid) and accelerate peristalsis. food, apparently) about 30 years ago when he saw the toxicity studies. know the actual materials and process used in making it. what they have to do. – says to eat liver only occasionally because it depresses the thyroid. methods and stress from importation and treatments make them carcinogenic. – with cheese and milk, the feeding of the animals (grassfed vs.
grainfed) is more the issue than raw vs. pasteurized. Proteins: Daily protein should be at least 80 grams, preferably 100 if you are working or otherwise active. An egg has about 6 grams, a quart of milk about 32 grams, meat, cheese, and fish are usually about 20% protein, so a pound would be enough for a day. It’s important to have fruit or other carbohydrate with the protein for efficient metabolism. Milk, cheese, eggs, shellfish are good protein sources, and potato protein is high in quality, if the potato is very well cooked and eaten with butter or cream. Although potatoes contain only about 2% protein, a kilogram of potato has roughly the protein value of a liter of milk (which is 3% protein), because of its high quality. Unless you are buying eggs from a verified grass-fed, free range source he recommends limiting them to one or two a day, and making sure to have plenty of carbohydrate around the same time. Regarding his recommendation of daily gelatin: For an adult, gelatin can be a major protein in the diet, since the need for cysteine and tryptophan decreases greatly when growth slows. Ox-tail soup (boiled for 4 or 5 hours) and lamb shanks have a good proportion of gelatin. I think most stores have gelatin in one pound packages or bigger, for example Great Lakes gelatin is usually around $11 per pound. If a person eats a large serving of meat, it’s probably helpful to have 5–10 grams of gelatin at approximately the same time, so that the amino acids enter the blood stream in balance. Asian grocery stores are likely to sell some of the traditional gelatin-rich foods, such as prepared pig skin and ears and tails, and chicken feet. Although the prepared powdered gelatin doesn’t require any cooking, dissolving it in hot water makes it digest a little more quickly. It can be incorporated into custards, mousses, ice cream, soups, sauces, cheese cake, pies, etc., or mixed with fruit juices to make desserts or (with juice concentrate) candies. Peat is a big fan of dairy. He prefers milk with no added vitamins, raw if you can get it, but uses standard pasteurized-homogenized when there’s no alternative. He prefers cheese made without enzymes, just animal rennet. He doesn’t use yogurt because of the lactic acid and/or lactobacillus. He avoids anything with gums in it, like cream cheese. Ice cream like Haagen Dazs is okay since it has no carageenan or gums like guar/carob bean– these are often found in foods like cream cheese, canned coconut milk, and half-and-half; make sure that the ice cream does not have any vegetable oil in it as some varieties include this. Regarding yogurt, in quantities of an ounce or so, for flavoring, it’s o.k., but the lactic acid content isn’t good if you are using yogurt as a major source of your protein and calcium; it triggers the inflammatory reactions, leading to fibrosis eventually, and the immediate effect is to draw down the liver’s glycogen stores for energy to convert it into glucose. Cottage cheese, that is, milk curds with salt, is very good, if you can find it without additives, but traditional cottage cheese was almost fat-free, so when they make it with whole milk you should watch for other innovations that might not be beneficial. Although Peat basically scorns legumes, he said hummus in small amounts isn’t nutritionally harmful, though chickpeas and tahini are both allergenic for some people. Fats: Best sources are coconut oil and butter; olive oil and macadamia nut oil sparingly. He is a big fan of (refined) coconut oil to stimulate the metabolism. Among nuts and nut oils, macadamia is probably the safest. See the Omega-6 list below for more info. Carbohydrates: Have some with every meal to prevent hypoglycemia after eating the proteins. Fruit and fruit juices – If you’re able to do it, try to consume fresh fruits and fruit juices every day. Orange juice is great because of it’s potassium and magnesium content. Tropical fruits and juices are excellent too. If you don’t have a juicer at home, you can buy pasteurized juices with no additives that say “not from concentrate” on the label. Juices that are from concentrate are made up of mostly added water that is flouridated. Fruits in general are fine (tropical are best), but grapefruit is full of phytoestrogens, so avoid it, and berries are full of small seeds you can’t avoid, so it’s better to skip them. He recommends avoiding bananas and other starchy-poorly-ripened-industrialized fruits, which includes most apples and pears (when these are ripe, peeled and cooked they are much more nutritious, and safer). Organic dried fruits are fine as long as they are not treated with sulfur dioxide; canned fruits are okay, especially if they are in glass. You can have a small apple and some cheese as a snack occasionally if it doesn’t cause any digestive or allergic symptoms—the fat in the cheese is protective against the starch in incompletely ripened fruit. Tubers – Potato, yams; occasionally well-cooked grains in the order of best to least desirable: masa harina, white rice or oats, brown rice. The phytic acid in the oats block absorption of much of the calcium; cooking the oats much longer than usual might improve its nutritional value. Canned plain pumpkin if eaten with some fat is okay, but carrots are less starchy for similar effects. He recommends eating a raw carrot daily, particularly a raw carrot salad with coconut oil, for both its bowel-protective and an anti-estrogen effect. Summer squash and bamboo shoots are the best cooked vegetables; well cooked kale and broccoli are okay, too. Carrots are best salad. The fiber in whole vegetables helps protect against the effects of the unsaturated fats they contain (in comparison to fruit), which means that juiced vegetables with none of the protective fiber will act as a thyroid inhibitor because of the concentrated PUFAs. There isn’t anything wrong with using vegetables as a smaller part of your diet, but salads and steamed vegetable dishes shouldn’t be the main part of anyone’s diet. He recommends avoiding avocados as they contain so much unsaturated fat that they can be carcinogenic and hepatotoxic (toxic to the liver). Beverages: Coffee supports the metabolism but has to be consumed with some sugar or with meal to prevent stress response due to low blood sugar. Because of the tannins in tea, it’s important to use either lemon or milk (or cream). The histamine in red wine is a special problem for hypothyroid people, usually it isn’t harmful. Avoid: PUFAs and soy. PUFAs are found in processed foods, nuts and seeds and their butters, vegetable oils. Also keep in mind that if you have been eating PUFAs in the past, the oil change in your tissues takes up to four years during which your fat stores will be releasing enough PUFAs to cause you some troubles, so it requires some patience and also some skillful means to counteract their effects, like getting some extra vitamin E or a little thyroid to counteract their antithyroid action etc. It all depends on how your metabolism works. Chocolate is okay as long as there are no additives. For salty cravings, Peat recommends tortilla chips fried in coconut oil, and chicharrones (pork rinds) with no additive but salt (puffed in hot air). Another snack is popcorn popped on the stove in coconut oil, then salted & buttered; the oil and butter are protective against the starch, but it’s harder to digest than tortilla chips or chicharrones. Vinegar is a good antiseptic when it’s used with raw carrot, but watch for sulfite when using regularly. Maple syrup is heated to a fairly high temperature, and this creates some sugar-derived chemicals that can be allergenic and might be toxic. Everything else is somewhere in between – it won’t kill you if consumed, but unless you are healthy it’s better to prefer above-listed foods. Regarding lifting. Vince Gironda had it all figured out back in the 60’s. V-bar dips, neck presses, sternum chins, sissy squats, frog squats, low inter-set rest, ignoring the amount of weight one uses, etc., and a natural diet with carb cycling. @Charles – Thanks for posting. Wonder what he meant by liver suppressing the thyroid? That is the first I heard that. @Brad – WOW! I don’t know how I never heard of Vince before. Very good post. I’m especially convinced of the wisdom of lifting to exhaustion but with simple, slow movements that have reduced risk and little need for skill or momentum. 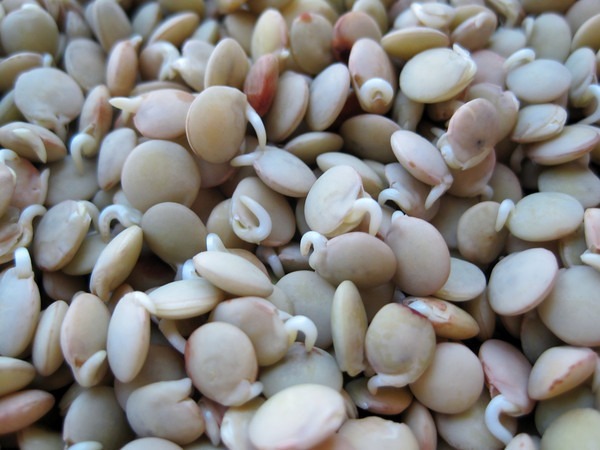 Beans – I agree that sprouted is very probably better than not sprouted. But my question is why? Why beans at all? Of course this is a personal preference, but gastronomically I think there is nothing good about beans. If a cheap filler type food is needed, I suggest peeled potatoes. In my imagination, potatoes are much more “alive” as foods than beans, which are dried, left alone sometimes for months, or kept in plastic for months and then rehydrated. @Glenn – Thanks. I don’t eat beans very much, but there are a few Indian dishes that I like to have maybe 2 times a year. Potatoes are much more of a staple. Chins and rows as a replacement for the deadlift? LOL. I’m 54 years old, and manage to bench, squat, press, and deadlift (1x each per week) without the world falling off it’s axis. I’ve been doing so for many years now. @Mike – My point is that I can go to failure safely with chins and rows. Can’t do that with deadlifts without hurting yourself, which I’ve done. My bias is always toward safety in movement, so I seek alternatives to exercises that require perfect form and timing for safety. I know that fatigue negatively impacts those variables in skilled movements. I do like the deadlift way more than barbell back squats. If I were to resume the DL, I’d use dumbbells or a Hex Cage bar, as the weight is closer to the body. Thanks for the critique/criticism. You do it ver well. Always makes it a value add, from my perspective. On nuts. I put that in there (handful a day) but in personal practice, now consider them an indulgence. Over time, it’s basically a nut per day. I think it’s probably wise to consume a handful now & then (ever week or two) because we simple don’t know what we’re missing, including hormetic benefits. I think we evolved with toxins and poisons and they may actually be “essential” in a “dose makes the poison” context. Other than the truly neolithic and novel, I tend now to shy away from total elimination. Artisanal bread? I’ll indulge. Just not often and never as a staple. Sugar? I’m beginning to think it’s less problematic in terms of a real food diet than lots of stuff. vegetable/seed oils? That’s an absolute. You get more than enough anyway if you ever eat at restaurants. On lifting. I don’t think it’s a big issue. I go very infrequently to the gym, now. I have kettle bells in the backyard and it’s more like play, now. And I’ve begun doing hikes again, but I like short with lots of vertical. Still, I like to go push and pull some heavy weight about a coupla times per month, but far less than max effort. @Richard – Great point about hormesis and nuts. I discovered being super strict and avoiding peanuts caused a problem which I discussed in this post.